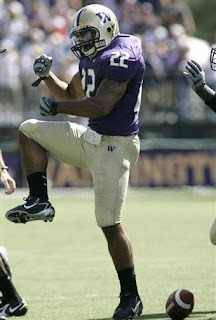 And now we come to the end of the line, as our in-state friends from Montlake are up as the final WSU opponent of 2009. We could joke about their beliefs that they are ultra-superior to many PAC-10 programs, yet they have been one of the worst since 2000 (more on that later). 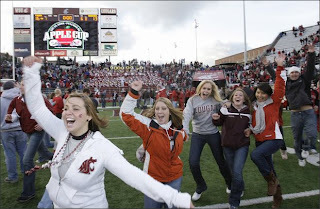 We could poke them for a small, mouthy group of Coug alums single-handedly sinking their $150 million dollar Olympia tax grab towards a renovation of Husky Stadium. Not that it’s entirely true, of course, as there were several factors at play when Olympia failed to act. We’re just the easy scapegoat, and it’s understandable. Don’t get your way? Blame someone else. Case closed. But nah. We won’t do any of those things. It’s a new era in Seattle, as Stevie Sarkisian steps away from the rather large shadow of Pete Carroll and takes the reins of his own PAC-10 program. And Sarkisian was able to lure his partner in crime at SC, Nick Holt, back to the Northwest to lead his defense. And so far, it’s safe to say the guy is winning the “battle of the podium”, don’t you think so? From the super-energetic press conferences, the endless Twitter updates with how awesome everything is (“12:30 – stuck in traffic. GO DAWGS!”), etc. But you know what? It’s working. UW’s racking up the verbal commits, and right now they have the top collection of verbals in the PAC-10. That list includes QB prospect Nick Montana. You know, Nick Montana. The son of Joe Montana. The QB Husky fans wanted all along. Please, pay no attention to all the lapping up of all-things-Jake-Heaps. That was all just a big joke. They are happy Heaps is following his heart and headed for Provo to play for BYU. They never wanted him anyway. It was always about Montana…..
Look, there are signs that Sarkisian is off to a good start. Even Coug fans can see it. Reports are that spring practices were filled with energy and enthusiasm, and the local media has been slurping it up. Sarkisian has reportedly reached out to the fans, opening the practices and doing what he can to get people involved and excited. And why not? The last regime was about as exciting as another loss on a rainy November day in Seattle. Not only did they have a closed off, stubborn coach who was too serious/boring, they also LOST A LOT OF FOOTBALL GAMES IN THE PROCESS! Ty Willingham’s record was an abysmal 11-37 in Seattle (wow! ), including 6-29 in the PAC-10. That four-year stench includes three 10th place finishes, with the lone bright spot a 9th place finish in 2006. 2008: 0-12, and they looked awful doing it. Included was a hard-to-swallow 28-27 loss to BYU, when Jake Locker drew an excessive celebration penalty for throwing the football about 50 feet over his head as he scored in the waning moments of the fourth quarter. 15-yard penalty, BYU blocks the PAT, GAME OVER, drive home safely. And of course, the ’08 Apple Cup, pitting two of the worst Washington-Washington State teams in the modern age against each other on the same field. We know how that turned out…. 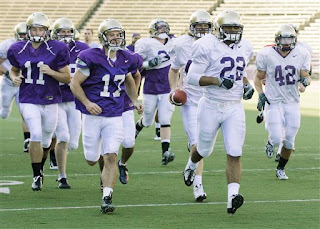 But all in all, from top to bottom, just about the worst experience imaginable for UW’s 2008 season. FANS ARE: JACKED UP ON HOLT AND SARK SAUCE! They have been drinking it by the gallon, and are convinced that things are all set to turn around. The eternally optimistic Sark is in the midst of a long, tender embrace at the bosom of Husky nation. And we can’t really blame them for being excited after such an awful ’08 season. But get a few Zima’s in a Husky fan, and deep down, they will admit that the feeling among the Husky faithful understand that this thing is going to take a while to right the ship. This wasn’t just a bad team because of Jake Locker’s thumb injury that sidelined him for 2/3rds of the season. There was a team-wide lack of talent, athleticism and speed, particularly on the defensive side of the ball. It will take time to get pieces in the right place to succeed. Washington controlled the action for 59 minutes, bringing themselves to the verge of snapping the longest losing streak in the country and becoming the last Football Bowl Subdivision team to beat someone. The Huskies (0-11, 0-8 Pac-10) bounced on the sideline at the prospect of ending the worst skid in school history. Then their misery was extended thanks to an unlikely hookup that added a new duo to Apple Cup lore. Washington State quarterback Kevin Lopina, playing just a week after getting knocked out with a concussion, was erratic all day. He missed easy throws and open receivers. He ran when he shouldn’t and often threw to the wrong receiver. But he was nearly perfect in the final minute as the Cougars drove 69 yards to force overtime. After hitting Brandon Gibson to convert a third-and-1 at his own 34, Lopina found freshman Jared Karstetter right in stride sprinting behind a beaten Washington secondary. Karstetter, with only three catches all season, raced for 48 yards to the Washington 18 with 24 seconds left and suddenly overtime was a possibility. “You never really plan on something like that,” Karstetter said. Karstetter then caught a 7-yard pass but didn’t get out of bounds, forcing Lopina to rush to the line and spike the ball with 2 seconds left. Grasu, with a nervous stutter step at the start of his approach, then hit the first of his three kicks to send the game to overtime tied at 10. The Cougs would capitalize on two Ryan Perkins missed field goals, the last leading off the second OT, and WSU’s Nico Grasu would nail the game-winner from 37 yards out. OFFENSIVE SYSTEM: It’s going to be different in ’09, that’s for sure. Expect a lot of what you used to see out of USC, with a decidedly west-coast-offense flavor. Look for a fullback, a tight end, and multiple WR sets on occasion. But the big change is supposedly going to be at QB, where Sarkisian has already claimed that Jake Locker is going to learn to be a more complete QB who stays home vs. tucking and running at the first sign of trouble. The QB running the ball isn’t going to be completely taken out, but, it will certainly be curtailed a bit in the new pro-style offense. 117th in scoring offense (13.3 ppg), 106th in rushing offense (99.3 ypg), 101st in passing offense (163.8 ypg), and 116th in total offense (263.2 ypg). Granted, the majority of the season was with a redshirt frosh QB in Ronnie Fouch, who was clearly not the caliber of QB in Jake Locker. But a miserable year offensively. ’09 RETURNING OFFENSIVE STARTERS: Hard to say, but some accounts say six starters are back, others say up to eight. But no matter the number, there are a lot of familiar faces back from last year among starters and backups. TOP OFFENSIVE PLAYER: Who else but Jake Locker? A fabulous athlete who could probably play running back, linebacker or safety in the PAC-10, he’s the best football player on the UW roster. He had a flashy ’07 season, but it was a little bit of fools gold if you want to know the truth. Sure, he ran for nearly 1,000 yards, and he threw for over 2,000 his first year. But he threw more INT’s than TD’s, and his completion percentage was a pedestrian 47%. In ’08, there was some improvement intially in terms of taking care of the ball, as Locker didn’t throw a pick in the three and 1/2 games he played. He completed 53.8% of his passes last year, up from the 47% the prior year. But he threw just one TD and was averaging only 128 yards per game through the air when he went down with the broken thumb in week four. He is really going to have to take some strides in the accuracy department as a passer if UW has any hope of making some noise in ’09. DEFENSIVE SCHEME: Think USC defense, only not as big, fast or talented. But seriously, it will be your garden variety 4-3. DC Nick Holt will bring the intensity, that’s for sure, and the USC defenses have been legendary of late. 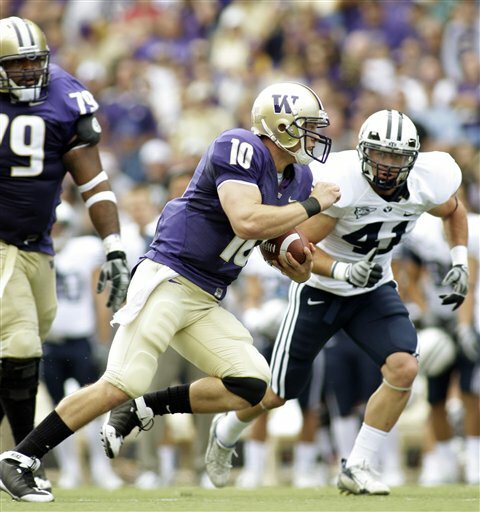 ’08 DEFENSIVE RATINGS: You thought they were bad in ’07, where Washington set school records for defensive futility? They were WORSE in ’08. Hide your eyes…. 116th in the country in scoring defense (38.6), 117th in rushing D (240.6 ypg), 62nd in passing yards per game (211.2), and 110th in total defense (451.8). Washington would finish last in the PAC-10 in interceptions (7), and would tie for last in sacks (16). So basically a push-over defense that didn’t take the ball away OR get pressure on the QB. Yikes. ’09 RETURNING STARTERS: At least they’ll be experienced. UW returns eight starters on D, including the return of linebacker EJ Savannah. TOP DEFENSIVE PLAYER: We could go with Daniel Te’o-Nesheim, he of his eight sacks on a terrible defense last year. He had exactly 50% of the team total in that category alone, so at least he didn’t quit in a lost year. Mason Foster had a breakthrough ’08, leading the team in tackles (105) and tackles-for-loss (12). But instead, I’m going with the number one player who will make the biggest impact in ’09, and that is EJ Savannah. Savannah had a huge 2007 season. He led the team with 111 tackles, 14 for loss, a couple of sacks and an INT from the outside linebacker position. But grades and other issues, including not seeing eye-to-eye with Willingham, plus a broken arm suffered from arm wrestling (? ), had Savannah on the sidelines for ’08. But with the hire of Sarkisian, Savannah gets a clean slate. He’s back for his senior year, ready to lead in ’09. Health has been a problem for Savannah in the past, where he missed some time in ’06 with a hand injury and ’05 with a neck issue lingering from high school. But if he’s healthy, he’s a lead-pipe cinch to rack up at least 100 tackles. 1) How does Locker look in the new offense? This might have been the biggest story of the entire spring, and that is Locker looks to be over the broken thumb from last year. He had a productive spring, and was reportedly improving with each practice. But, like it or not, the heat – and weight of the UW program – will be on Locker to improve, quickly, in the revamped UW offense. Sarkisian knows his QB’s, playing the position at BYU and coaching several good ones at USC (Carson Palmer, Matt Leinart, John David Booty and Mark Sanchez). You have to believe he knows what he’s doing with a talent like this. We’ll see if it actually translates to the field. I wouldn’t count Locker out though. He is on a special level in terms of ability, among the most physically gifted to ever play the position in the conference. 2) Can the offensive line give Locker a chance to be special in ’09? Everyone thought the return of Juan Garcia for a PAC-10 record 17th season at center last year would mean UW would road-grate their way to all sorts of rushing records (note – Garcia only played five years. It just felt like he’d been at UW since a young upstart named Bill Clinton won the White House). But the line was a disappointment, as the running game averaged only 2.8 yards per carry. And quite honestly, as a group they might have been exposed a bit once Locker was out of the lineup. Locker’s scrambling ability kept defenses honest, but he was so elusive that he helped mask a line that was strong, but below-average at pass-blocking and looked a little soft around the midsection. They gave up 32 sacks last year, not a terrible number, but 10 of those were in the first 3 1/2 games with Locker at QB. Even he couldn’t get out of the way of the opposing pass-rush. Three starters are back up front, including the entire left side plus the center in Ryan Tolar. But the right side is new, featuring converted defensive tackle Senio Kelemete moving across the line to right guard. Their top priority has to be keeping #10 healthy and confident in the new scheme, or else it could be another long, brutal season on offense. 3) Can the D get any worse? After a school-worst ’07 defensive season, UW brought in Ed Donatell with his shiny NFL resume’ to turn it all around, but they actually took a step back in ’08. Pretty amazing, but ’08 was WORSE than ’07. But as stated above, they will be experienced, and the return of EJ Savannah will be a huge boost to the defense. The top five tacklers are back from last year, and that doesn’t even include Savannah. I bet that with the number of experienced returners, combined with the energy and intensity of Holt, will see this group improve by leaps and bounds over ’08. 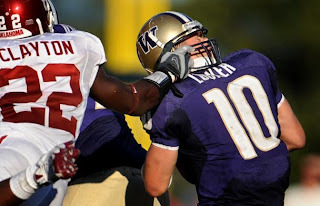 WSU FOOTBALL BLOG SEZ: It’s been a slow roll down the hill for UW, but in ’08, they finally hit bottom. The reality though is that this thing didn’t just flatline overnight. It’s been flickering for years. Including the 2000 season, where UW won the Rose Bowl and went 11-1, the Huskies are now just 44-62 this decade, 29-29 at home. That puts UW 8th in the conference since the 2000 season. But instability has had a lot to do with it. UW is now on their fourth coach since that glorious Rose Bowl year (Neuheisel-Gilby-Willingham-Sarkisian), and that’s just far too many changes to build anything with consistency. Compare that string with the Oregon schools for example, where it’s been Mike Riley for several years, and Mike Bellotti for many more than that before Chip Kelly got the Oregon gig this year. It’s hard to know exactly what they are getting with Sarkisian. A positive salesman and showing to be a pretty good recruiter right now, absolutely. And it’s hard to argue against his success with QB’s at USC. But as is often the case, predicting what a long-time assistant is going to do when he gets his own BCS program and all that goes with it is very difficult. The schedule gets off to a rough start. They open with LSU in Seattle, where that SEC speed and power will be on full display to open the Sarkisian era. They get a layup the next week in Idaho, where the losing streak should finally come to an end. But then it’s USC on 9/19, where Sarkisian gets first crack at Pete Carroll. They close out September with a tough road game at Stanford, where Harbaugh and the Cardinal are looking like they could be one of the surprise teams of the PAC-10 in ’09. Then they open October at South Bend, where Notre Dame has the look of a potential BCS bowl written all over them! It could very well be a 1-4 start to ’09. They also go to ASU, UCLA and Oregon State, while they host Arizona, Oregon, WSU and close the year against Cal on 12/5. In the end, there is nowhere to go but up here. And they will be better, probably a lot better defensively. But it’s going to be a process. If I’m a UW fan, I’m looking at things with the idea of improvement across the board as the ’09 season goes on. Not so much the W’s and the L’s, but what kind of effort and intensity are the Jimmie’s and Joe’s putting out on a weekly basis? And with that, if they show some real improvement, well, 2010 could be a year they return to respectibility. Locker will be a senior by then, and right now there are a lot of sophomores and juniors up and down the roster. In 2010 those young kids will be upper classmen, and it could be a year where they make some noise. But we’ll see. Sarkisian is a lot of “sizzle” right now, but will there be any steak to go with it? We’ll find out! That’s it for a Tuesday. I hope you have enjoyed the ’09 WSU Fish Wrap series. We have a link to the top-left of our links, so you can go back and see every ’09 WSU opponent, plus you can check them out here. ENJOY YOUR DAY, and GO COUGS! You are currently browsing the archives for the Nick Holt category.